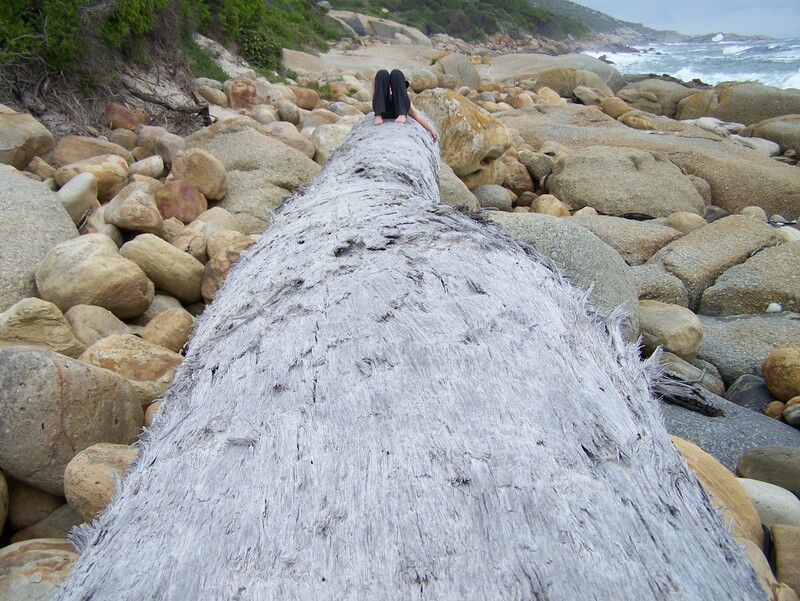 Walking along the remote beach of Sandy Bay, we discovered two enormous trees that had washed ashore from a stricken cargo ship. At first, from a distance, I was incredibly excited and ran towards the closest one, which had the words ‘love while you can’ written on it. I liked the message, I loved the tree but as I tried to climb it, something stirred in me. I remembered the stories I’d heard from a Brazilian man… About how the trees are brought down to the ground in the rain forests: two tractors drive through the forest with a huge chain saw between them..
And the relevance to a ‘food blog’? Thanks DK for the above 3 photos… and for the link that tells more about ‘the logs’ : http://allafrica.com/stories/200808140687.html . Lana, how beautiful. And thank you for bringing the plight of the forest and trees to people. 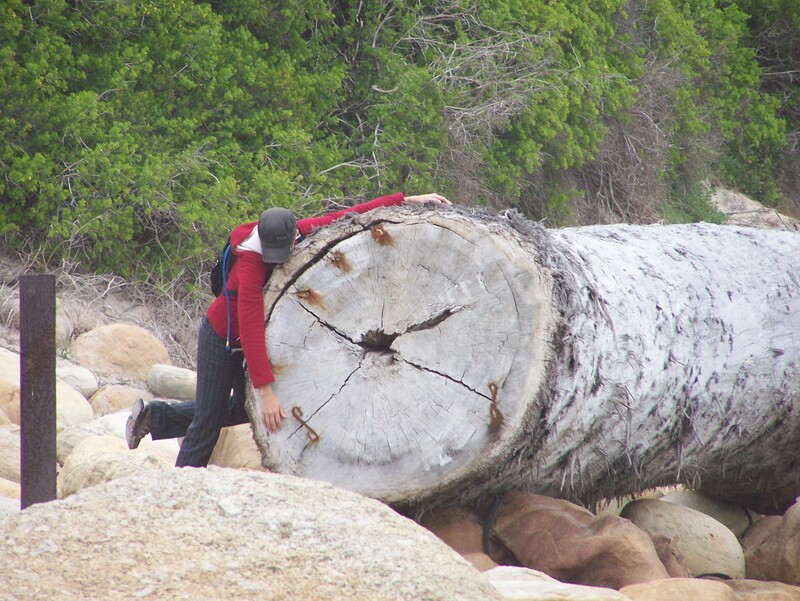 It’s always sad to me to think of how a lovely life-giving tree can be cut down so easily. Your pictures are beautiful and sad. Now on to the message…I believe we are given signs and messages as we need them. Until I just now wrote the last sentence, I didn’t think the message was for me and anyone who reads your blog, but as I deal with family issues, I’ve decided that I was supposed to see your tree and engraving today, and “love while I can”. So Lana darling, thank you, and as for you…love while you can! Thanks so much, Debs, you make me feel like I’ve written something worthwhile! 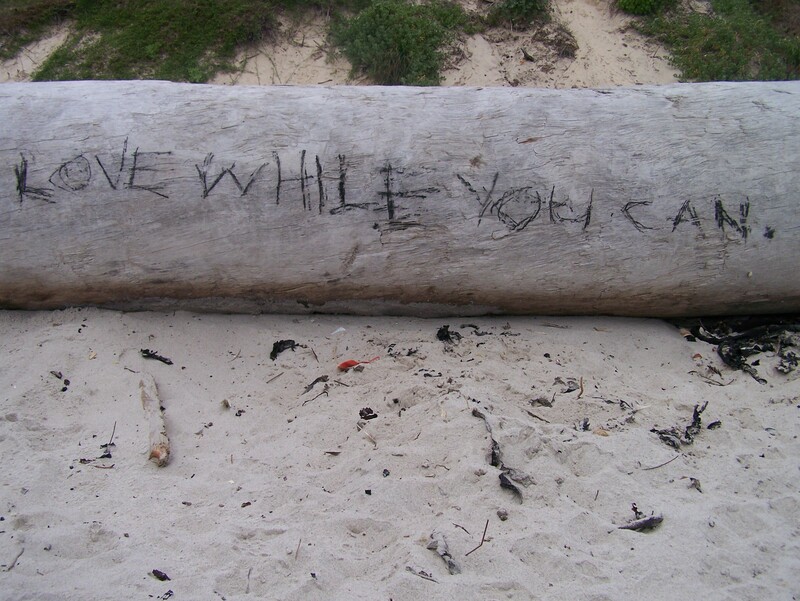 As for ‘love while you can’- what a potent bit of graffiti to find on the beach… so glad you got something out of it too! Kittispike, as you say, the issue is Ginormous. Thank you so much Col, and it is a special message. I’d love to know who wrote it. The marks are as much of a mystery – let’s call them rusty dollar signs for now. Lots of love and hope you’re feeling a whole lot better… x! And, to think, that whoever wrote that.. must have written it after the tree was cut down. I wonder how that all came about? In Madagascar, tons of logs are being shipped out of the country illegally, to China. The loggers are killing the lemurs that live in the forest and selling them in the markets as meat. These animals don’t exist anywhere else in the world. I read your article – THANK YOU so much for writing it and for posting a link here. It is terribly sad what is happening in Madagascar and all over the world. It’s a great crime against nature and such a loss. What can we do as individuals beside curb our demand for hard woods? I read that these particular trees in my post were headed East as well. I cringe when I think that some of my friends have got so wealthy out of importing Indonesian hardwood furniture… and all of us who buy this stuff. Here’s a new slogan: I love wood but I love trees MORE. Please feel free to leave any further thoughts on what we can do? Thanks again Jenny.